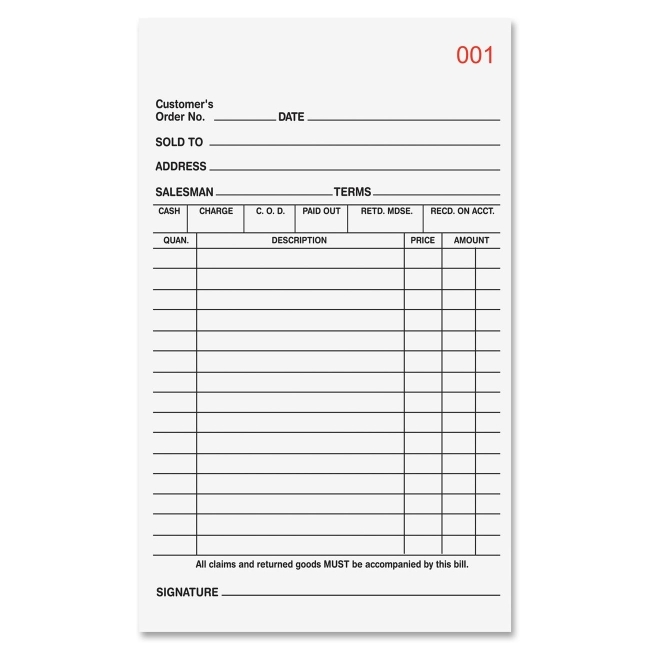 All-purpose book of carbonless forms can be used for orders, sales, purchase orders, credit memos or receiving forms. 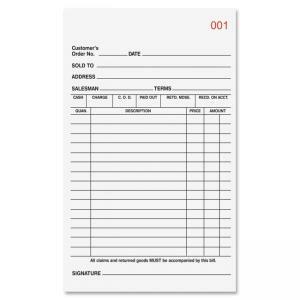 Versatile, two-part forms include prompts for date, "sold to," buyer's address, salesperson's name, terms, seller's signature, item description with quantity, price and amount. A line of boxes above the item description allows you to check or fill out "Cash," "Charge," "C.O.D.," "Paid Out," returned merchandise and received on account. Forms are consecutively numbered in red ink and perforated at the top for easy tear-out. Paper sequence is originals in white and duplicates in canary. $5Rediform Sales Book Form - 2 Part - 6.37" x 4.25"
$7Tops Purchase Order Book - 2 Part - 7.87" x 5.5"
$4Adams Carbonless Sales Order Books - 3 Part - 7.18" x 3.34"